Beauty balm, blemish balm, BB cream - whatever you call it, this product is everywhere lately. The coverage level is somewhere between tinted moisturizer and traditional foundation, and promises even skin tone, sun protection and all-day wear. Convinced yet? I haven't tested BB cream for myself, but I foresee a pretty little tube in my near future. I'll be sure to recap after I try it! 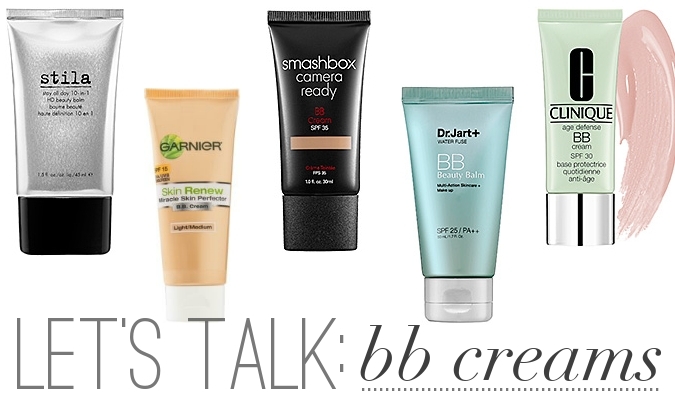 Have you tried BB cream yet? What's the verdict? My friend has tried the Smashbox one and she ravesss about it! I can see myself trying this one for summer & I love that it has SPF 30! I have an Estee Lauder one that I use on occasion, but mostly I just use pressed powder + blush. My beauty routine needs some help, methinks. haha - it's always good to change it up every once in a while! do you like the estee lauder bb cream? almost bought the Smashbox one last time I was at Sephora, but decided to hold off, not sure if it was worth it! I think that's the one I'm going to try first! Glad to hear you like it. Awesome! If you do buy it, I'd love to see a how-to post about how you wear it (with concealer? powder over? )...I'm still playing around with it and would love some ideas! I've been wearing the Garnier BB Cream for about a month now. I never did traditional foundation, and this is lighter, but I think it gives my face a more even tone. I use it more like moisturizer in the morning before I put on my makeup.